This is such a departure from Rana Heredia’s usual patterns that I didn’t want you to miss it and just had to share! I even love the name! Her pattern line is called Sewn into the Fabric – and it was never truer than with this beauty! The texture for the head and shoulders is cut out of a jelly roll. The body is a coordinating print. What an impressive quilt – and the scraps can be made into a pillow! These are just sew darn cute, I had to share! These sweet and simple drawstring bags are perfect for holding small gifts and treats. And, they are made with just two fat eighths of fabric! You probably already have some in your stash! 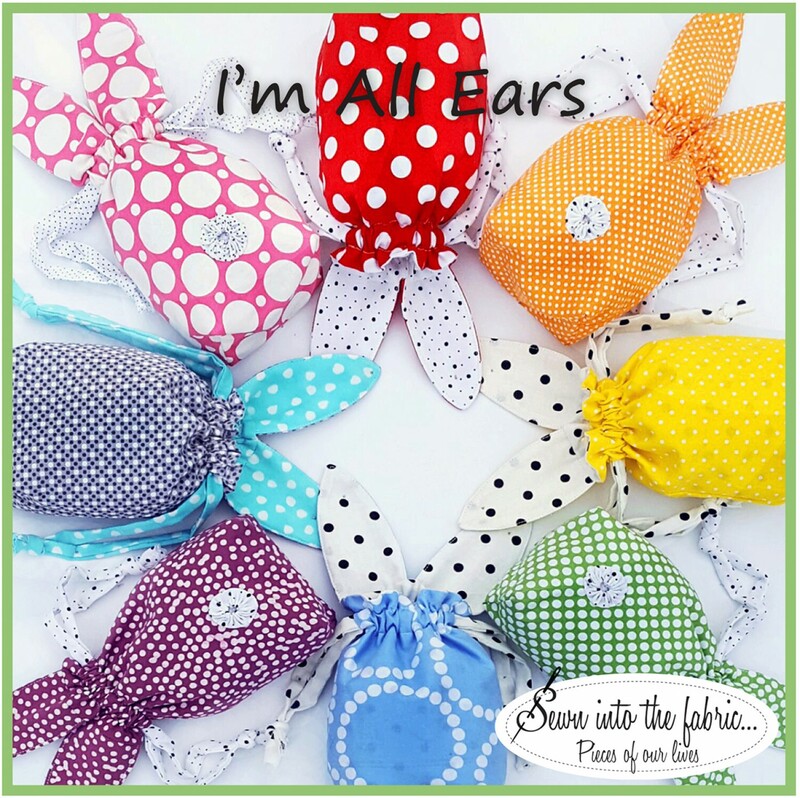 Rana Heredia of Sewn into the Fabric has created the perfect project just in time for your Easter baskets or hide them in the yard for that Easter Egg hunt. But everyone loves bunnies so the rest of the year, tuck them in backpacks and lunch boxes to add a hug to any day. These bunnies are like M & M’s – you can’t stop at one! Since machine quilters are getting close to being booked through the holidays, it may be time for you to start steering your customers into projects that they can actually complete. These stocking patterns by Sewn into the Fabric are reasonably priced so each member of the family can have their own design. The black and white stocking with the asymmetrical cuff reminds me of a tuxedo while the simple white stockings with bows provide a great canvas for those who love machine quilting. Or choose traditional styles that can be made in a matter of minutes. Or choose Minkee cuffs for your favorite princess. Add a gift card or special little something in the pocket incorporated into the front of these stockings. Or embellish them with a vintage broach. Visit our website to see everything by Sewn into the Fabric, At these prices, your customers will want more than one!